Yesterday I was pottering around FYE in Kingston scanning the “New Releases” display and came across the above (click the image to see it blown up). It’s a slim-line CD case with a folded piece of paper in it. There is no disc in the box and no barcode on the card. 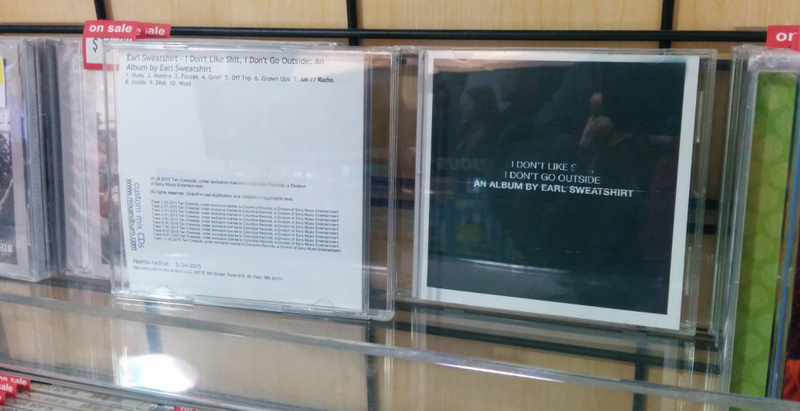 The front of the card has the (obscured) full title of the album and Earl Sweatshirt’s name on it. The back has a basic tracklist, copyright information and little else. The actual physical copies of the CD (to which buyers will have first sale rights) will be in stores on April 14th. The list price appears to be $11.99. Amazon has it pre-order for $11.96, Barnes and Noble for $10.92 and it’ll likely be less at your finer local independent record stores. So why would I “buy” a burned CD with no attendant rights for $14.70 when I can get a real disc with real artwork for less and actually have the right of first sale? Be the first to comment on "What does it mean when a “traditional” record store “sells” downloads?"